Cupcake wedding centerpieces are a hot wedding trend at the moment! Not only do they look good, they are also a yummy snack for your guests and one that you could have as a wedding favor too. Dual purpose wedding items we love as they are a great way to save money. The beauty of this idea is that you can use real cupcakes or opt for flower arrangements in cupcake vases. Never heard of cupcake vases? Neither had I until recently! There truly is a world of cupcakes out there! 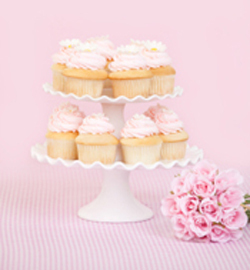 An easy and quick way to create a cupcake centerpiece is to fill a three-tier cupcake holder with cupcakes! Or if that is too many cupcakes per table you could look at having a simpler glass cake stand. You could have your wedding colors on alternate cupcakes or if you have a very distinct theme then you could add that to your designs too. Monogram cupcakes are a classy look and you could even have your guests names on each one. Make your cupcakes even more glamorous by using cupcake paper liners. There are colored plains and printed ones. The choice for prints is quite extensive- baseballs, autumn leaves, butterflies, flowers, seasonal prints and more. Choose which one suits your wedding theme and then you can have less decoration on the cupcake. Making actual flower cupcakes may not be so easy. A traditional cupcake is topped with either a fondant flower or gum paste flower. You might have to order this type of cupcake from a professional baker. Choose varied flowers as toppers and base the colors of the fondant flowers on the wedding theme. Arrange the cupcake flowers on pretty platters then set them on the table as cupcake centerpieces. You can place the platter on a lace doily and add some votive candles around the platter for more visual effect. Another cupcake flower centerpiece idea is to use the same fondant flower cupcake but in one color and one type of flower only. Source for a flower pot, paint in the color of the cupcake flower. Fill the flower pot with round floral foam up to the rim. You need about 7-9 pieces of cupcakes. Skewer the cupcake with a wooden one or a floral pick. Place the tallest skewered cupcake in the center of the floral foam. Arrange all the other cupcakes on the floral foam to make for a nice cupcake flower arrangement. You could cover and fill-in the rest of the floral foam with tulle or organza. Tie a ribbon around the flower pot for a more festive arrangement. 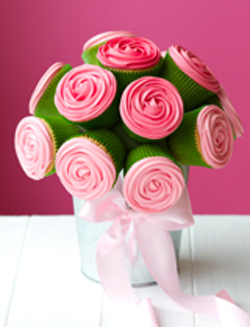 If you wish to use real flowers for a cupcake-like centerpiece, have a look for a cupcake vase. This type of vase is available in a variety of colors. The cupcake-shaped plastic vase has placement holes in it to easily arrange fresh flowers. It is non-breakable and can be used over and over again. Choose the color that will suit your requirements. Choose the fresh flowers that you prefer and arrange them in the cupcake vase. Keep the stems short but cut them in varied heights for a rounded floral arrangement. Tie a ribbon or a length of organza or tulle for the finishing touch on the cupcake vase centerpiece.